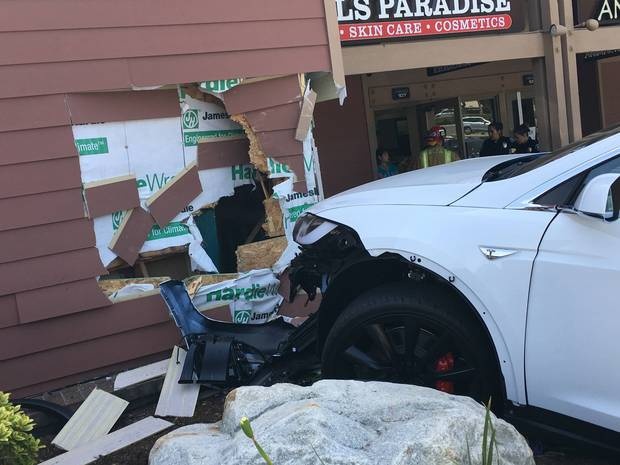 Data analyzed from a Model X SUV that jumped a parking lot curb and crashed into a building was not the result of autonomous driving technology, Tesla said Monday. 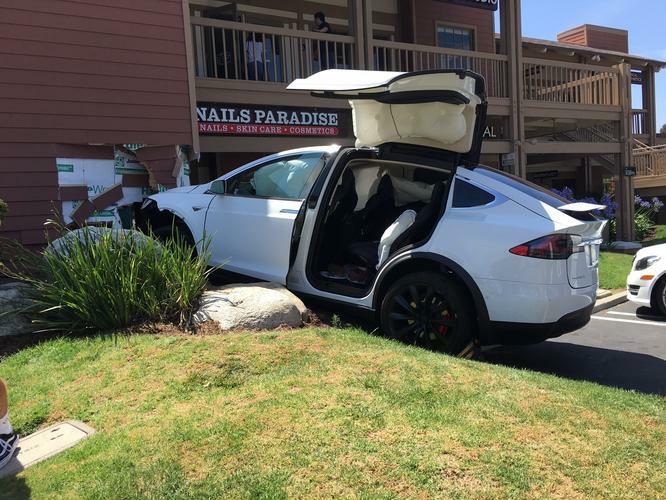 The owner of the brand-new Tesla Model X SUV said his 45-year-old wife was driving the car at about 2 p.m. Sunday. As she was parking the vehicle in a shopping plaza in Irvine, Calif., the vehicle suddenly accelerated at "maximum speed" by itself, said Puzant Ozbag, the owner of the vehicle. Ozbag said the vehicle had been delivered only five days earlier. He said his wife had not activated any self-driving features at the time of the crash and that she didn't mistakenly apply the accelerator pedal instead of the brake. In an email response to Computerworld, Tesla said it analyzed vehicle logs, "which confirm that this Model X was operating correctly under manual control and was never in Autopilot or cruise control at the time of the incident or in the minutes before." Tesla's data shows that the vehicle was traveling at 6 mph when the accelerator pedal was abruptly increased to 100%. Consistent with the driver's actions, the vehicle applied torque and accelerated as instructed." 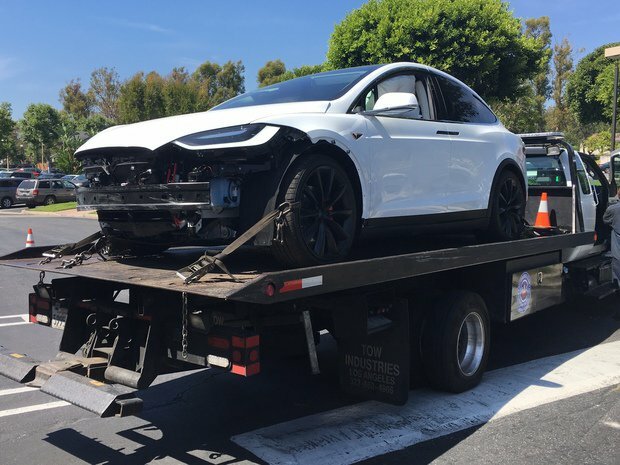 Puzant Ozbag's Model X on the tow truck after the accident. Puzant originally posted about the accident on a Tesla Model X forum. "The acceleration was uncontrollable, seemed maximum and the car only stopped because it hit the building and caused massive damage to the building," he wrote in the post. Vehicle pedal application errors are more common than people may assume, according to a 2012 study by the National Highway Traffic Safety Administration (NHTSA). The researchers found that there were seven to 15 crashes per month in the U.S. caused by pedal application errors. Females were the drivers in nearly two-thirds of the pedal misapplication crashes identified in crash databases and in a media scan used in the study. The damage to the front end of the Model X and the shopping mall building. "The most consistent finding across data sources was the striking overrepresentation of females in pedal misapplication crashes, relative to their involvement in all types of crashes," the NHTSA stated in its report. Possible explanations for the higher rate of accidents among women might include greater exposure to areas where pedal application error crashes occur most often (i.e., parking lots), or a poorer "fit" in their cars due to shorter stature, which may increase the likelihood of a pedal application error; or a disproportionately high rate of one or more functional deficits that contribute to pedal errors, such as neuropathy, the NHTSA's report stated. The study noted that finding the reason for this anomaly could be "important as a starting point in designing crash countermeasures." The report also found that most of the crashes involved the youngest drivers, those age 16 to 20, and the oldest, those 76 and older. "Across age, the most common contributing factor in pedal misapplication crashes was driver inattention," the NHTSA stated. "Distracted drivers may be more likely to be startled by an unexpected event or traffic situation, and in their panic to stop or slow the vehicle, may press the wrong pedal." The NHTSA researchers based their findings first on a review of technical literature published between 1980 and 2009, and then analyzed news reports on about 899 U.S. crashes from 2002 through 2012. The research team also conducted two crash analyses, one based on 31 crashes in the National Motor Vehicle Crash Causation Survey (NMVCCS) between 2005 and 2007, plus 2,411 pedal misapplication crashes between 2004 and 2008 contained in a North Carolina state crash database. Tesla stated that "safety is the top priority" and "we engineer and build our cars with this foremost in mind. We are pleased that the driver is ok and ask our customers to exercise safe behavior when using our vehicles." A spokesperson for the Irvine Police Department said the cause of the accident is under investigation.